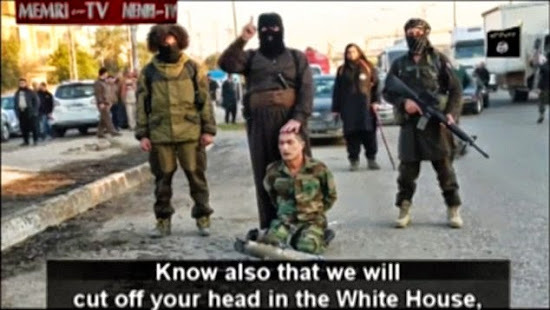 Islamic State militants threaten to cut off Barack Obama's head and turn the U.S. into a Muslim province in the latest gruesome video to emerge from their self-styled caliphate. The militant delivers his biblical-sounding tirade flanked by comrades and standing over a kneeling Kurdish soldier who, in a gruesome climax to the video, has his head cut off. The video has emerged on the day the Islamic State threatened to kill a Japanese journalist and a Jordanian pilot within 24 hours unless a jailed female terrorist is released. Memri TV discovered the latest video and translated it from Arabic. The Biblical-sounding threats do not stop at America, but also include a message for France and 'it's sister' Belgium. 'We advise you that we will come to you with car bombs and explosive charges, and will cut off your heads,' the militant warns. But he saves his most insulting language for Iraqi Kurdish leader Masoud Barazani. 'We are going to behead you and throw you into the trash bin of history,' he announces. This latest video circulated by Islamic State comes as a separate video posted on jihadist websites shows a picture of Japanese hostage Kenji Goto holding a photograph of captured Jordanian pilot, 1st Lt Mu'ath al-Kaseasbeh. A video posted on jihadist websites shows a picture of Japanese hostage Kenji Goto holding a photograph of captured Jordanian pilot, 1st Lt Mu'ath al-Kaseasbeh. A voiceover, purportedly by Goto, warns that Jordan is blocking the Japanese journalist's release by failing to free Sajida al-Rishawi, a would-be suicide bomber on death row since 2006. The statement says Goto and al-Kaseasbeh will be killed within 24 hours if al-Rishawi is not freed and urges the Japanese government to put pressure on Jordan. The voiceover warns: 'Any more delays by the Jordanian government will mean they are responsible for the death of the pilot which will then be followed by mine. 'I only have 24 hours left to live... and the pilot has even less. Please don't leave us to die. Japanese government spokesman Yasuhide Suga said he had seen the video, but did not comment on its authenticity. 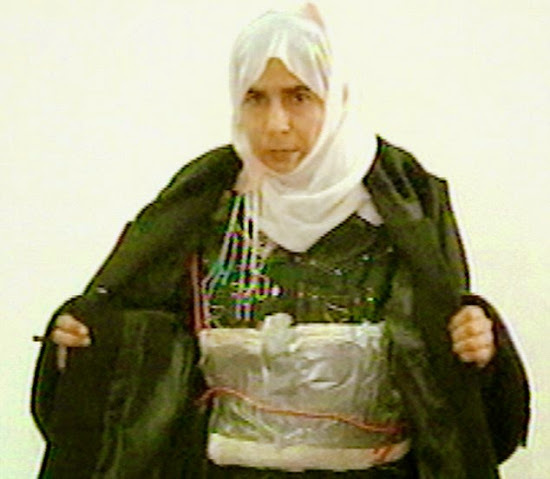 Sajida al-Rishawi was sentenced to death in Jordan for involvement in a 2005 terror attack that killed 60 people. The video matched a message released over the weekend, which also called for her release though neither bore the logo of the Islamic State group's al-Furqan media arm as other footage has done. The weekend video showed a still photo of Kenji Goto holding what appears to be a photo of the body of the second Japanese hostage, Haruna Yukawa. 'I hope we can all firmly work hard and join hands to co-operate, and for the two countries (Japan and Jordan) to co-operate in order for us to see the day when the Jordanian pilot and our Japanese national Mr Goto, can both safely return to their own countries with a smile on their faces,' he told reporters late Monday night after another day of crisis talks in the Jordanian capital. It was the first time a Japanese official mentioned al-Kaseasbeh, who has been held by the extremist Islamic State group after crashing in December. It wasn't clear when the pilot's possible release had entered the picture. Freelance journalist Kenji Goto was seized in late October in Syria, apparently while trying to rescue another hostage, 42-year-old Haruna Yukawa, who was captured by the militants last summer. Japanese officials have indicated they are treating the video released over the weekend as authentic and thus accepting the likelihood that Yukawa, a 42-year-old adventurer captured in Syria last summer, was killed.